Author: Clavell, James Set In . . . Description: Tehran, Iran 1979: Simmering religious tensions finally explode, and the Iranian people rise up against the Shah. The country, once secular, is now thrown back into an orthodoxy that threatens to tear it apart. The United States and Russia go on high alert, with warships heading to the Middle East. The region becomes a powder keg, waiting to explode. Caught up in the revolution are a British helicopter company and its pilots. The oil fields of Iran need helicopters to ferry workers and administrators, and when the main US aviation company pulls out of Iran fearing what might come next, S-G Helicopters steps in to fill the void. Soon they realize that they, too, must leave or risk losing all their machines to whomever takes control of the country. The company risks bankruptcy if that happens—which would ruin Andrew Gallavan and reveal that the company is actually owned by a secret Hong Kong-based consortium: Noble House, controlled by the Struan family. Caught in between is his son, Scot, a pilot in Iran who must help save his father’s company, but also the other pilots and their families. In a risky move, the pilots concoct a plan to get their choppers out of Iran. But will they be able to escape a country crumbling around them before it’s too late? A rich panoply of characters brings to life the events of forty years ago, events that even now have ramifications throughout the Middle East and beyond. 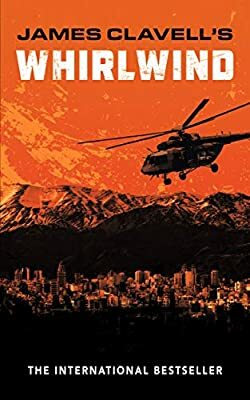 Fast-paced and full of action and intrigue, Whirlwind is an intricately plotted and detailed tale of war, love, and the ingenuity of the human spirit, told by James Clavell, the unparalleled master of historical fiction.